This August Steiner ladies Swiss quartz watch features large easy to read Arabic numerals with baton individually applied markers on sunray silver dial. 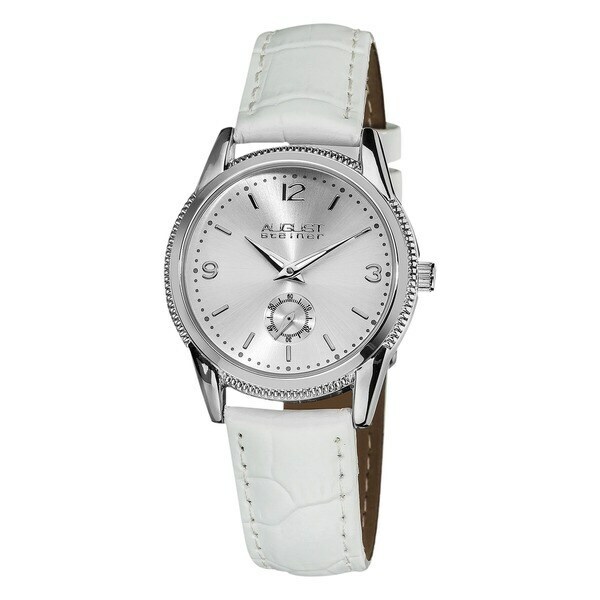 This watch features a second subdial and leather strap making it perfect for every occasion. The watch arrived in good time and in excellent condition. It's very accurate and has all the qualities of a very good watch. It's the fourth white watch I bought in the last three years, and the first one not to show any moisture problems in this hot, humid climate. The band is sturdy leather, so I expect it to be around for a very long time. A super purchase, and I will be buying August Steiner watches again. This watch is perfect for me. It is lightweight and easy to read. It looks very dressy if you are wearing dressy clothes but it also blends in as casual when you are dressy sporty or casual. It's a "wear anytime watch" and I'm very happy with it. Always on time with this timepiece. Wanted a watch with a white band and silver trim. Had been told that August Steiner were good watches, Satisfied with watch.. This watch is attractive - the gold-tone shines and looks "rich" but not gawdy. It keeps perfect time including the second-hand and fits my wrist (8"). The band is not as supple as I'd like it to be, but I wouldn't consider it a problem. All in all, it's a good buy. Although I had to buy a wristband (see above), I really like this watch. It has an elegant look and feel it, and I like where the second-hand sweep is located--in the middle where I can see it easily. My only recommendation is to make the wristband a few inches longer for those of us ladies whose wrists are somewhat large. Other than this, I consider this watch a t high-quality timepiece. Love the silver and white combination on this perfectly-sized watch. It even fits my skinny wrist. This is a very nice watch. The white leather straps look of good quality. I will wear this watch often in the spring/summer months. I will probably purchase another watch from this brand, I have a fetish for watches of different colors and styles ! I was looking for a rose gold watch that wasn't too pricey. This watch fills the bill. The strap is pretty darn wide, so beware if you have a small wrist like mine. Other than that, it looks good and runs well. This watch is a pleasure to wear. It looks very expensive and keeps good time. I am very pleased with it. The band is a little stiff as it is new leather but it will conform with wear. That means is should last a long time!! I questioned whether I should return this before I even received it. I was a little afraid about the size of the case. I have very little wrists and was concerned it would be too big. But when I got it and opened it up, I was amazed. I put it on and I love it. It is just beautiful. I'm very pleased with this watch. I hope it lasts as long as my other watch which I had for over twenty years. Thank you!! This watch is just beautiful and looks much more expensive than the price paid for. Nice but watch face bigger than my wrist. This watch is a very nice piece. I was looking for a big watch, but this was way too big for my wrist. Wish it could have been a tad smaller. I had to return and found another piece and very happy with it. I found this on another website and it was sold out, so I was happy to see it on here and for less! This watch looks adorable with almost all my summer outfits. Such a cute accessory. Band is a bit stiff at first, but softens with wear. Good quality for this price. Mine had a small yellow mark on the side of the casing on arrival. Contacted Overstock, and they remedied the problem in a few minutes. Overstock is the best! Didn't work. So I cannot recommend it. Nice watch. face is not too large. The leather band is substantial and will hold up to everyday use. Beautiful contrast between the rose gold and white band. The face hasn't scratched and I have worn it for months. This is my second one. I've turned my wife into a watch lover. I like this watch as it is exactly as pictured. The band fits my small wrist though the face being large slips on my wrist ending up being off center. I am constantly readjusting where it sits on my wrist. The band is a little stiff and the second loop to secure the end of the band came unglued. I have reglued it and hope I don't lose the small loop. I will keep the watch and hope that I can put up with the slipping. The price was right for the value. Over the years, I have bought several August Steiner watches for myself and as gifts. I highly recommend them for their great quality and good looks! "What battery is used and how long does it last?" "I have a small wrist. What are the dimensions of this watch? Is it water resistant?" The band width is 1 5mm, the length is women's standard between 6 3/4 inches and 8 inches. The case diameter is 32 mm and the case thickness is 10 mm. Water Resistant 3 atm or 30 m.
"Love the watch, but is not running at all. Is there any help you can give me or will I have to return it. Thanks for your time"
I have this watch and I love it. It keeps perfect time! Have you tried changing the battery? It could be this simple. If not the battery, perhaps a jeweler would check it out for you, without charging an arm and a leg. I wouldn't put a lot of money into a watch this inexpensive. You may have to accept the fact that there is nothing you can do about it. wanted a summer white watch and this is just the looke I was looking for.